With an end to this harsh Massachusetts winter almost in sight, we hope to get through the next month or so without more serious accidents due to icy and snowy conditions. Recently, a group of two dozen youth hockey players, coaches, and parents narrowly escaped a potentially fatal roof collapse at the local ice rink in Canton, Massachusetts, according to a recent news article from NECN. Witnesses say the team was at the rink for early morning practice when a large section of the roof came crashing down without any significant warning signs. Around 7 a.m., the team was on the ice, when they heard loud noses from the room. Around a second later, the coach heard a loud snap and started screaming. He was screaming for the kids to get off the ice. Witnesses say there were seven kids directly under the section of roof that came crashing down, and they barely had time to hear their coach’s voice and get out of the way before being crushed by the falling roof, snow and ice. There was such violent force created by the falling debris that a wall at the opposite end of the rink was destroyed. Firefighters have determined after an initial investigation that the roof collapsed due to a buildup of snow and ice. 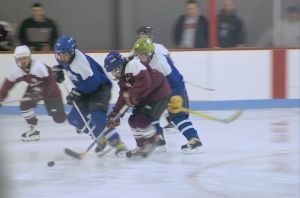 Immediately following the accident, Massachusetts Department of Conservation and Recreation contacted operators of the more than 30 other ice rinks in the Commonwealth to warn them to make sure their roofs are cleared of snow and ice, so this type of potentially fatal accident does not happen again at another rink. While nobody was hurt in this accident, many children, coaches, and parents could have been injured or killed. This is the reason state officials wanted to quickly warn operators of other ice rinks. As our Boston personal injury attorneys can explain, actual or constructive knowledge (warnings) often play a crucial role in premises liability cases. Under Massachusetts law, property owners are required to act in a reasonable and prudent manner to prevent predictable injuries to foreseeable persons and property. Basically, this means it is necessary to determine whether a property owner knew or should have known a particular accident was likely to happen and whether someone was likely to be injured in this type of accident. In the case of a roof collapsing under the weight of ice and snow, this would depend on whether property owner knew or should have known there was enough snow to collapse the roof. One way to prove property owner knew or should have known the roof was likely to collapse would be from actual notice. Actual notice would be someone telling property owner there was enough snow or ice to cause a collapse or property or an employee performing an inspection of the room and seeing first hand the condition of the roof. Constructive notice, on the other hand, would be knowing these types of accidents have happened elsewhere, and they should be on the lookout to prevent a similar accident from happening on their property.